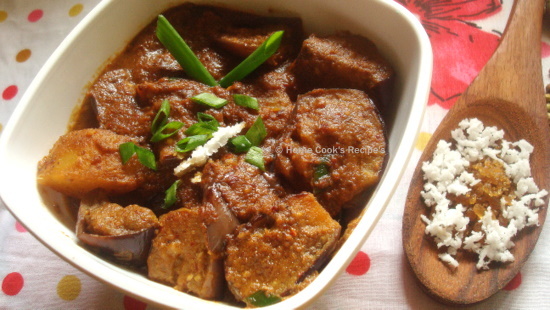 When i was bored to cook ennai kathrikka kuzhambu, i got the idea of trying Thai Eggplant Curry. I just Googled and went ahead to cook with what all ingredients i had at hand. I should tell you, that this is not an authentic Thai Recipe, this is customised recipe for an South Indian Vegetarian Palatte. But this won' t cheat you in any way. 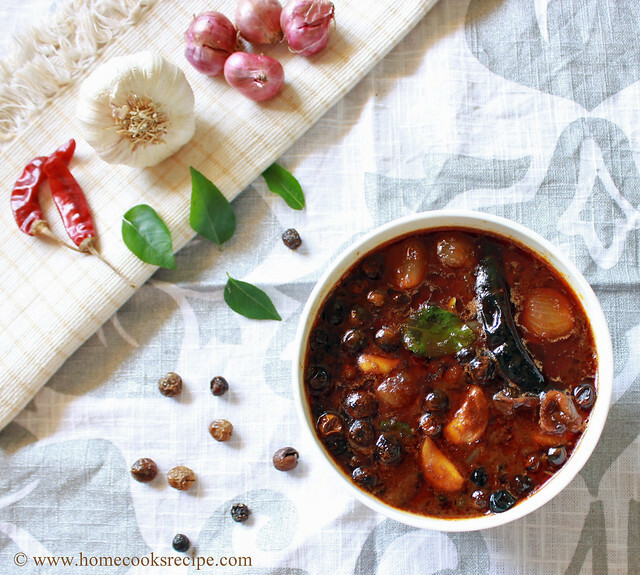 This is such a Flavourfull Curry that i have ever cooked. It was little spicy, little tangy, little sweety, little heavy. No flavours' dominated the curry and all played its role perfect. 4. Soy Sauce - 1 and half tbsp. 6. Tamarind Paste - 4 tbsp's. It's authentic to grind using pestle and mortar. If you feel its tough to grind, add some tamarind water and grind to a fine paste. Curry Paste on Top left and Tamarind water on Bottom right. First Heat the oil in a Pan and add the chopped potatoes and and roast the potatoes till they are semi-cooked. Add the freshly chopped Eggplant's to the pan and fry along with the potato's, till the eggplant's start to shrink and change its skin colour. add little bit salt to cook the eggplant's fast. Now add the Massaman curry paste to the pan and saute it along with the eggplant's and Potato's. Let the curry paste get sauteed along with eggplant's for a minute. Add the Tamarind juice and let it boil for 2 minute's. Slow the flame and add the Coconut Milk. Mix well. add salt to taste and Let it rest in slow flame for about 10 minute's. Add the Palm sugar and mix well. also let the curry stand on slow flame for about 5 minutes. Serve with some chopped spring onion's on top with Rice. 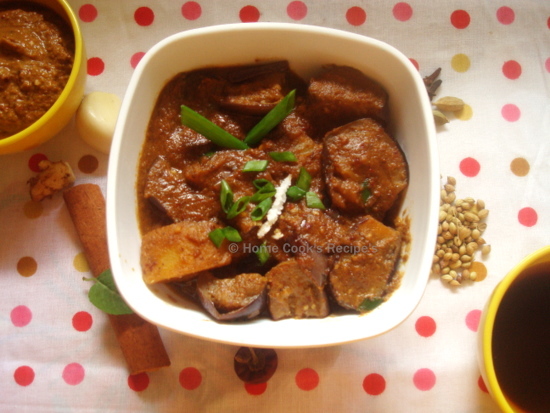 This is such a flavourfull curry with soft eggplant's and Potato's. It was little spicy, little tangy, little sweety, little heavy. No flavours dominated the curry and all played its role perfect. 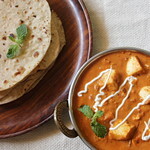 ** Do not use Nutmeg more than specified in the recipe, it makes your curry sweeter. so make sure its presence is not felt. Great post. I love indianised versions. will try it. Wow Lavi, such a droolworthy dish, just love the way u served the dish in coconut shell, very creative..
Looks soo lovely esp the first pic in coconut shell, heights of creativity! Wow thats absolutely tempting one .. Looks so good and wish to taste it. Love the first picture, curry looks great. 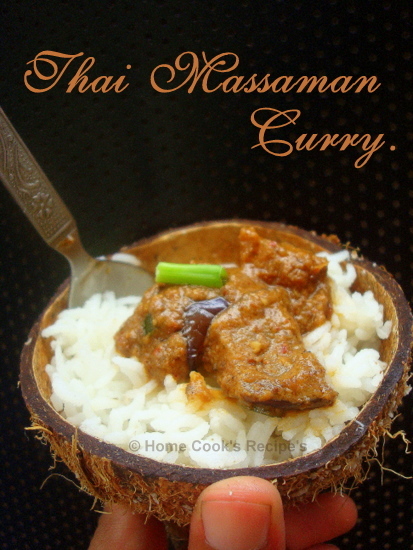 I love Thai cuisine and love your recipe too. Looks great.. loved your presentation and clicks..! 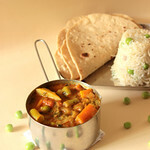 I love eggplants and this curry sounds fantastic, classic first pic :) which photo editor are you using? and which font is that on the first pic? Nice idea - using a coconut kernel for your pic. Looks good. 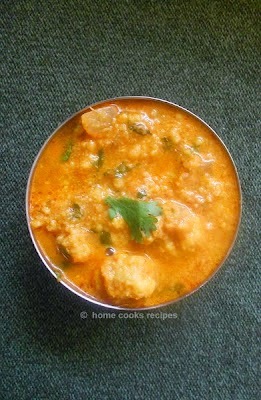 wow a delicious curry would love to make it. Beautiful pictures lavi,u have excellent photography sense. One of my fav curry. Looks absolutely delicious. Nice click lavi.